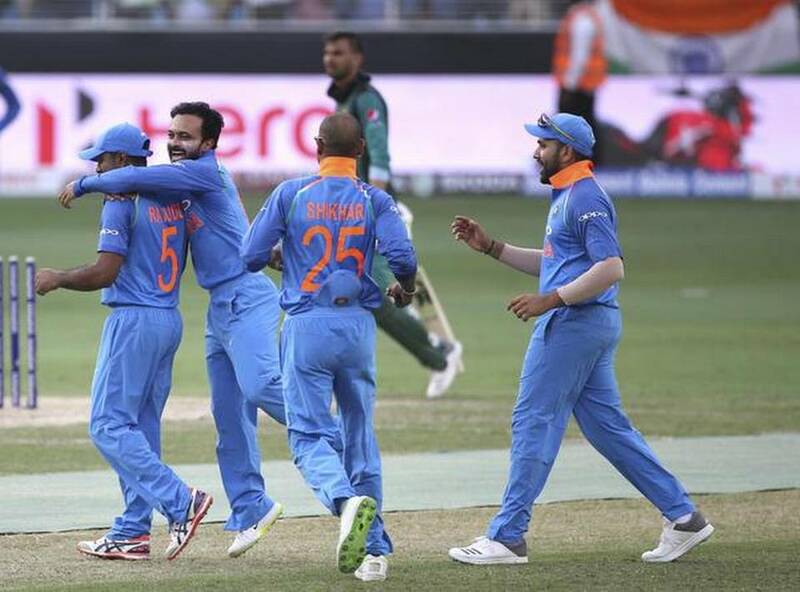 The atmosphere was electric and the players charged up, but the big battle — despite the result pleasing a majority of spectators in the stands — between India and Pakistan turned out to be a lop-sided affair, just like their last meeting in the Champions Trophy final in 2017. While Pakistan had dominated proceedings that evening at The Oval, it was India’s turn to avenge the loss, that too in style, with an eight-wicket win in just 29 overs here on Wednesday. After the pace duo of Bhuvneshwar Kumar and Jasprit Bumrah, along with ‘Mr. Utility’ Kedar Jadhav, had bundled Pakistan out for 162 at the Dubai International Cricket Stadium, the writing was clear on the wall. Once skipper Rohit Sharma, with some sublime strokeplay, got India off the blocks quickly, it was clear that the match would be over sooner than the scheduled close. Despite losing Rohit to a Shadab Khan googly, soon after his fifty, and his deputy Shikhar Dhawan on the cusp of one, Ambati Rayudu and Dinesh Karthik helped India cross the line. Bhuvneshwar and Jadhav’s performances augur well for the team, considering the two are on a comeback trail after suffering major injuries in the recent past. Bhuvneshwar, who missed the Test series in England owing to a back injury, couldn’t have asked for a better start — deceiving Imam-ul-Haq just outside off in the third over. With Jasprit Bumrah, making his maiden appearance in the tournament, keeping the pressure with consecutive maidens at the other end, Bhuvneshwar then enticed Fakhar Zaman into a leading edge that lobbed to Yuzvendra Chahal at mid-wicket. At three for two in the fifth over, Babar Azam and veteran Shoaib Malik got into rebuilding mode. The latter was assisted by some shoddy work in the field, with M.S. Dhoni and Bhuvneshwar giving him a reprieve. Once chinaman bowler Kuldeep Yadav broke the partnership in the 22nd over by castling Babar, Jadhav took over. The diminutive player mixed his round-arm and slinging off-spinners to bamboozle the batsmen. There was a moment of fielding brilliance when Manish Pandey (substituting for the injured Hardik), fielding in the outfield, scooped the ball on the run, threw the ball back as he crossed the boundary line and came back in to complete the catch to dismiss Pakistan captain Sarfraz Ahmed. Soon, Rayudu’s direct hit left Malik short of the crease and at 100 for five, the game was all but over. Jadhav then dismissed Asid Ali and Shadab before Bhuvneshwar and Bumrah wiped the tail off to ensure India didn’t have a big total to chase.